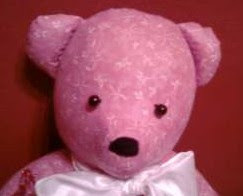 Awww...my granddaughter would love this bear. She loves stuffed animals, and pink is her favorite color. Www.ikatbag.com is great. Love your bear, thanks for the chance to win. The bear is super cute!! This is my favorite. I guess it counts as a craft blog. One of my favorite craft blogs is craft.com. Thanks for the giveaway! Your bear is adorable!! One of my favorite craft blogs is http://stacysews.com/. she does a little bit of everything. 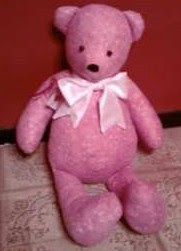 A pink bear! What a wonderful idea! I really love Pink Penguin. Such a lovely blog and she makes such cool stuff. i don't have a favourite craft blog, but sewing is made-by-rae.com Cute bear!!! A great craft blog is http://grosgrainfabulous.blogspot.com/. Thanks for a chance! Wow! So adorable! My favorite blog lately is I love life - she's a fab painter! What a darling bear! It would match perfectly in my little girls' room! My new favorite craft blog is http://www.iheartnaptime.net/.